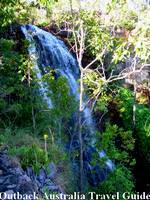 Four permanent waterfalls adorn the Tabletop Range of Litchfield National Park. 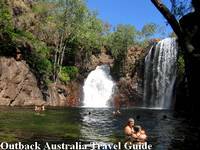 Wangi Falls and Florence Falls feature short easy walks, are photogenic and are great for swimming. At Wangi Falls a visitor can step from their air-conditioned vehicle, in high heels if they like, enjoy a short shady walk through a tropical monsoon forest and a refreshing dip in the large plunge pool. Every tour bus stops at Wangi Falls, and so does every self driving visitor to Australia's Top End. At least that's how it seemed to me. 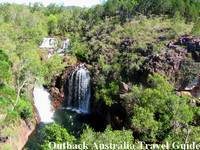 On this page I describe the main attractions in the order in which you will find them along the Litchfield Park Road, coming from Batchelor and the main entrance (see Litchfield NP Visitor Information). All these places are accessible by two wheel drive. 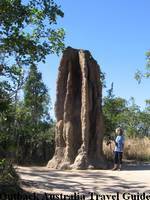 Only a few kilometres after the entrance is the site of the magnetic termite mounds. The mounds themselves are interesting to look at, but despite their unusual shape I didn't think they were that fascinating to view. What is fascinating is to read the displays about the termites. 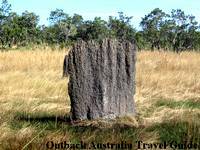 These termites build mounds that somewhat resemble tombstones: flat and narrow, and aligned along a north-south axis. You will often read that the mounds are perfectly aligned. Not true. They deviate by about 3 degrees (I think that was the number...). Actually, they deviate a bit more or less, depending on the microclimate in the particular location where the mound is found. The displays tell you a lot more about termites. About the many different kinds, how they live, what they eat (more grass than all the other grazing animals put together, they are the main grazers up here...), and how the compass termites manage to align their mounds so accurately. As I said, fascinating stuff. Florence Falls is usually the next stop. It's nearly as busy as Wangi Falls, but with a different crowd. To get to the plunge pool from the car park requires a steep descent over 160 stairs, and that means to get back you have to climb back up. There is another way to get to the pool, the Shady Creek Walk. It's a lovely short walk, first through open woodland, then descending into dense monsoon forest and following the creek all the way to the pool. The pool itself is of course great. It really doesn't matter how many waterfalls you have visited, you never get sick of swimming at them, do you? What I liked here are the picnic facilities. You find them at the start of Shady Creek Walk near the bottom car park. If you head left instead of right you'll find a series of clearings along the creek. All have barbecues and tables, and you can sit in the creek while eating... Hard to beat on a hot day. The path to the picnic sites is also the start of the Florence Creek Walk. Following it will take you to the Buley Rockholes. It's only a very short walk from the car park to the viewing platform above the falls, on a concrete path. But there is also an alternative route through the sandstone country along Tolmer Creek, which I really enjoyed. Only if you actually walk along the edge of the escarpment will you realise that you don't see that much from the viewing platform. Tolmer Creek has etched a very deep and narrow gorge into the Litchfield plateau, it's a striking scenery. There are a whole series of falls, but only the last one is visible from the platform. This place would have been magic in the old days, before Litchfield became a national park. I'd love to follow the edge of the cliffs, climb down to all the pools along the series of falls, make a day of it... (these days swimming is not allowed here). But the habitants of the caves at the bottom wouldn't like it... To protect the colonies of rare ghost bats and orange horseshoe bats that live in the caves the gorge and falls have been closed to the public. And that's good. The walk is neither long nor difficult, 2.7km return. But I guess most visitors to Litchfield National Park are in a bit of a rush, as usual, and since swimming isn't allowed here anyway they don't bother. In my eyes this was by far the most beautiful walk on our first day at Litchfield. I have never seen a veritable forest of palm trees like this one. Thousands and thousands of palm trees, the slender trunks so tall that you get neck strain looking at the tops. The palm tree forest is so dense that hardly any light penetrates to the bottom. The walk follows the creek, and the palm forest turns into monsoonal forest, and then opens up as you slowly climb up the slope of the Tabletop Range. Don't forget to turn around every now and then to admire the scenery! At the top you can have a short breather at the Tjaetaba Falls and then continue to the plunge pools further upstream. They look very inviting, so remember that swimming isn't allowed (it's a sacred site). Wangi Falls is the last of the big falls along the main road (or the first if you come from Berry Springs). It's the number one attraction in Litchfield National Park. 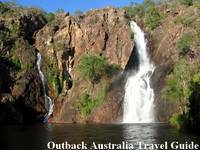 There aren't too many articles or web pages about Litchfield National Park that don't have a picture of Wangi Falls. Wangi Falls has the lot: the only campground in Litchfield National Park that allows caravans, a kiosk, nice lawns, picnic facilities and a huge plunge pool at the bottom of the falls. It has a viewing platform so you can take your compulsory shot of the falls, and a nice boardwalk with stairs at the steep sections. But as long as you don't come here looking for wilderness and solitude you'll probably quite like it. The scenery is beautiful and the falls are impressive. I really like the way the campground is laid out. The sites are set up in separate bays, somewhat set back from the circular road through the campground, and each site has its own fireplace. So even if the campground is full (it always is, better get here early) you still have some privacy. Litchfield National Park - Too Crowded? If you get an early start you can do all of the above in one day and then return to Darwin. 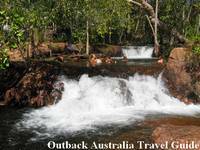 Most people who are travelling through Litchfield National Park on their way north or south stay at Wangi Falls, Florence Falls or the Buley Rockholes for one night.